This winter has seen a heated discussion about the acess to Norwegian supermarket shelves for small producers of beer and food. We are down to three groups of retailers controlling 99% of the market, and I would not be surprised if we end up with just two within five years or so. A major reason for this is the customs barriers, particularly for meat and diary products, which makes it impossible for European retail chains to establish themselves in Norway and enjoying the benefits of low costs for Pan-European products. LIDL gave it a try, but gave up after a few years. The smallest of the three, REMA 1000, has, to a lot of ridicule, decided to cut down on the number of breweries they want to give access to their shelves. The big acror benefiting from this move, Carlberg, is sitting very quietly, hoping no-one will notice the elephant in the room. This has, of course, been discussed a lot on Facebook, and I agreed to chair an event celebrating the diversity of Norwegian beer as a contrast. This was arranged by Gulating Trondheim, one of a chain of specialist beer shops who now number almost 20 outlets. 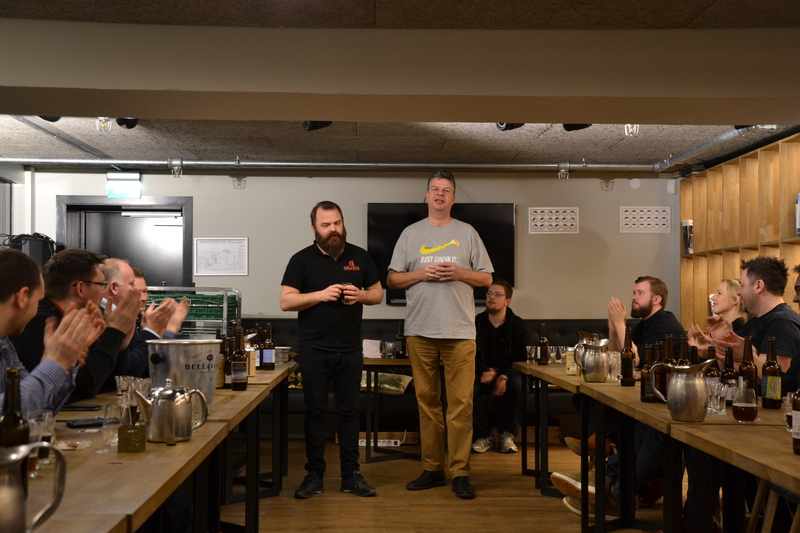 We decided to focus on beer for the Trondheim region, Trøndelag, and ended up with beers from 21 breweries. We could have included more, but 22 samples was probably enough. (There were two beers from both To Tårn and Røros). Tommy at Gulating was the one really doing the job here, and it was a great afternoon. 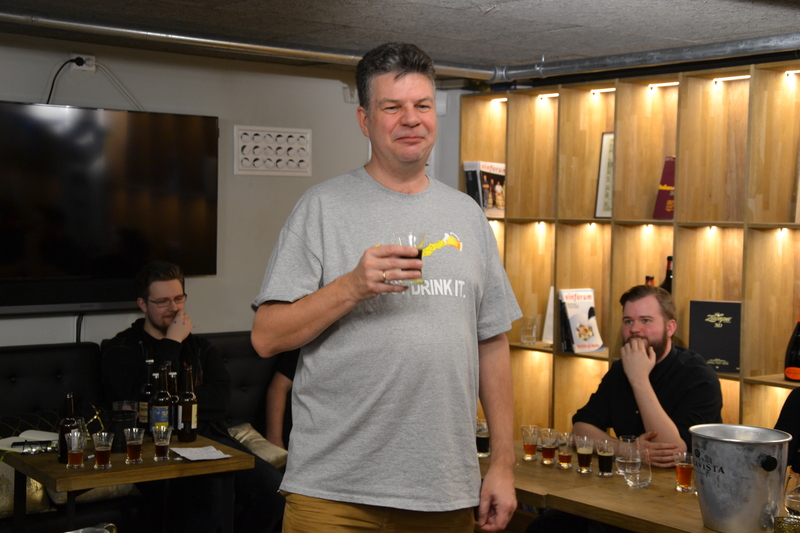 Børge Barlindhaug, head brewer at To Tårn brewery was also present, bringing samples of his most exclusive beer. This was a beer brewed with the bacteria culture used for the blue mould cheese Selbu blå, which turned out great. Just a few days before the event, it was announced that Mathallen, the food hall where the Gulating shop is situated, have to move out of their premises to make way for a discount store. In fact, out beer tasting was the last evenet taking place at Mathalle. Too bad, but a nice way to say farewell. And if you know of somewhere in Trondheim that could be suitable for a beer shop, pleas get in touch with Tommy! I found this sign in Berlin – a Kietzkneipe is a local pub in Berlin slang. Sometimes that’s what you need. With your standard beer, some local heroes to hang out with. And if you ask them politely, you might convince them to order some bottles of your favorite brews. Ask some brewery reps to deliver a few samples. I’m afraid I don’t have any local pubs in the neighborhood. But there is one close to work I should step by more often. With a fine range of bottled beers and sidewalk seating in the summer. That’s a new year’s resolution for me. The big events you plan for might turn out splendid. But it’s the beer bars you stumble upon that are some of the real gems. Here is one in Milan. The day before had been very eventful. I had been up bright and early, caught a flight to Milan and attending the opening of the new Baladin brewery. The next day involved transport back to Milan before we went home, but some of us had time to spare. We started off with lunch at an offshoot of the Birrificio Lambrate, their Golgi restaurant. It is similar to their brewpub I visited some years ago, for lunch there are good rustic dishes, and they have a good selection of tasty beers on tap as well as some bottles. With me for this session were two proper beer writers, Adrian Tierney-Jones and Martyn Cornell, as well as fellow Norwegian beer writer Ove Haugland Jakobsen, who has a day job as I do. We had a merry time sampling some of the beers available, including a very tasty bock and their Quarantot Double IPA. The merry beer writers enjoying a liquid lunch at Lambrate. By 2:30, the restaurant was closing for the afternoon and Adrian and Martyn were off to the airport. Ove had the sense to ask the waiter if there was another bar in the neighborhood that might be open. Sure, just continue down the main street, and there is one on your right. Six hundred meters or so along the boulevard we found the place, Au Vieux Strasbourg. What looked like a pleasant beer bar when we looked at the beers on tap turned into an excellent beer bar when we looked through the bottle list. An well curated range of Belgian beers is the theme here, they could have named the place after a Belgian city instead. From the beer mats and glasses, there seems to be a wholesaler/importer involved here, meaning there could be similar places across Italy. Never mind. We got through quite a few in a few hours’ time, and while the barman had limited knowledge of English, a lady who seemed to be a regular helped with the translation. A highlight for me was a bottle of Biere de Beloeil from Dupont. Fruity and funky, it had the splendid Belgian blend of fruit and stable, with tones of oranges and apricots. We were way behind schedule when we arrived at the airport for the check in. After all, we couldn’t possibly turn down the offer of a final glass of beer on the house. Sometimes, very rarely for me, you’re lucky your plane is delayed. This was one of those times. If you are in the area and feels the urge to imbimbe, you are lucky. Au Vieux Strasbourg is open 07-02, which is more user friendly than most Italian places. More user friendly than most places in the known universe, come to think of it.